Vega, the latest member of the family of launchers operated by Arianespace, and built by ELV as prime contractor, has successfully launched the IXV (Intermediate eXperimental Vehicle) atmospheric reentry demonstrator. 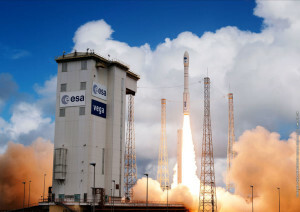 The fourth Vega launch took place on February 11 at 10:40 am (local time) from the Guiana Space Center in French Guiana. Developed by the European Space Agency, the IXV marks the latest step by Europe in the development of atmospheric reentry technologies, a key to manned flights. On the fourth Vega launch from the Guiana Space Center, the launcher carried a payload of 1,932 kg, including about 1,845 kg for the IXV demonstrator. Arianespace is the world’s leading satellite launch company, providing innovation to its customers since 1980. Backed by 20 shareholders and the European Space Agency, the company offers an international workforce renowned for a culture of commitment and excellence. Arianespace is the only operator in the world capable of launching any mass to any orbit from the Guiana Space Center. As of February 11, 2015, 221 Ariane launches, 36 Soyuz launches (10 at the Guiana Space Centre and 26 at Baikonur with Starsem) and four Vega launches have been performed. The company’s headquarters is in Evry, near Paris, and has local offices in Washington DC (United States), Tokyo (Japan) and Singapore.